Some dear relatives-by-marriage of mine hosted us for the Thanksgiving weekend in a warm place. I went for a run, came back to an empty house, and took a shower. … and the guests walked in. They’d been told several days earlier to arrive at 5:00 on Thanksgiving. They could tell that we weren’t ready, and they appeared to be quite uncomfortable. Of the 6 adults involved in dinner, only half of us seemed to be bothered by this mixup, failure-to-communicate, lack-of-modification-of-original-instructions, whatever it was. Surely an unusual situation, right? And those of us who were unsettled should maybe just lighten up? The first message: This kind of thing happens ALL THE TIME in construction communications, and in… well, let’s put my personal life aside. It shouldn’t be happening. Construction documents must communicate clearly. The entity who is responsible for sending out communications needs to communicate clearly, completely, unambiguously, and in a way that the entity who is receiving the communications can understand. The communicator is responsible for getting the message across. The dinner guests were not able to divine that, although they had been told to arrive at 5, they should actually show up an hour later, because the host got distracted by family fun at the beach, changed her mind about what time she wanted to receive guests, and failed to tell them to come later than previously indicated. Bidders, or the constructor, will not be able to know what’s in the sketches or project notebook on the architect’s desk at the office, or what conversations the architect had with the owner two months ago. All that the bidders have to go by is the construction documents. These have to tell the whole story. This is not just to be nice. This is the architect’s legal duty to the owner. Yes, bidders have to look at the entire set of contract documents, but if a window treatment sub is getting a whole story by looking at just part of the documents, he’ll save himself some time, and stop after reading those General Notes. In the case above, he may have gotten the wrong whole story, because of the architect’s failure to communicate correctly. The second message: If you, the architect, can’t get it right for the sake of getting it right, remember the guests, er… bidders. Think about how they’ll feel while trying to solve the mysteries of what you were thinking when you drew something that directly conflicted with other documents. Keep in mind that if you make them feel uncomfortable, or if you cause them to waste precious time during bidding, they will remember you for it! The whole point of dining etiquette is not about using the right fork – it’s about making sure guests are at ease. We have commonly-accepted guidelines about using the correct silverware so that we are starting on the same page, as much as possible, and so that it’ll be easier for everyone to be comfortable, and have a good time. Do this construction communication thing right. Issue clear, complete, concise, and correct construction documents, and make everyone comfortable. Bidding will go more smoothly, construction will go more smoothly, and your “guests” will be happy to be invited the next time. Cor-Ten: Why Does It Look Like Rusty Metal? Ever seen a gorgeous surface that looked like rusty metal? Well, if it’s weathering steel, often called by a brand name, Cor-Ten, it looks like rusty metal because it IS rusty metal. This material is really striking, has a great texture, has an interesting color, and is loved by architects. However, it has some extremely problematic negative aspects… but we might be able to get around some of those. Check out my latest technical article, published on the website of the Denver Chapter of the Construction Specifications Institute (CSI), “COR-TEN and Other Weathering Steel Alloys in Architectural Applications” . “Brake Metal” – What Is It? Have you ever wondered why architects’ construction details often have notes that call out “brake metal” (or, possibly, and incorrectly, “break metal”)? I never got a good answer. But when I started writing specs, I learned that brake metal is sheet metal that is formed in a press brake. This metal is often specified for sheet metal flashing and trim. 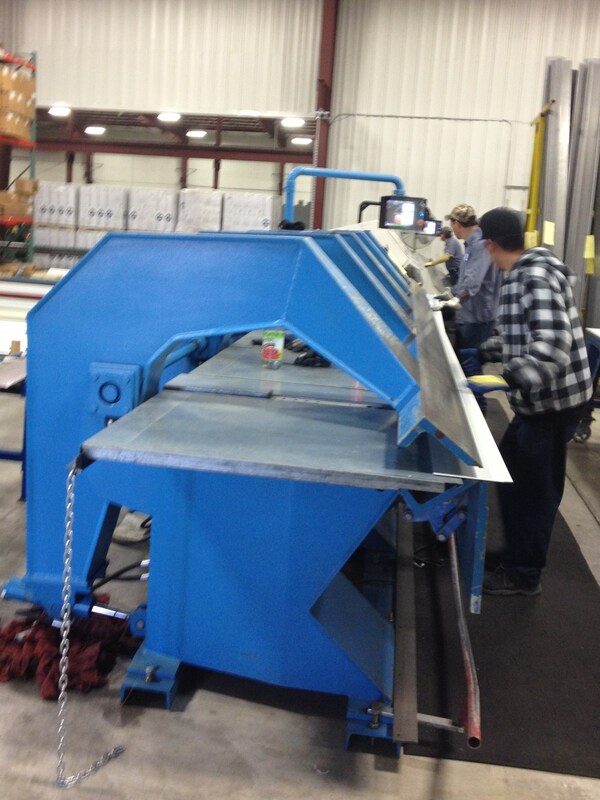 In this photo, above, a length of prefinished sheet metal is being inserted between the male die and the female die of a press brake. Next, the workers will pull up the bottom die, pressing the dies together, which will bend the metal. 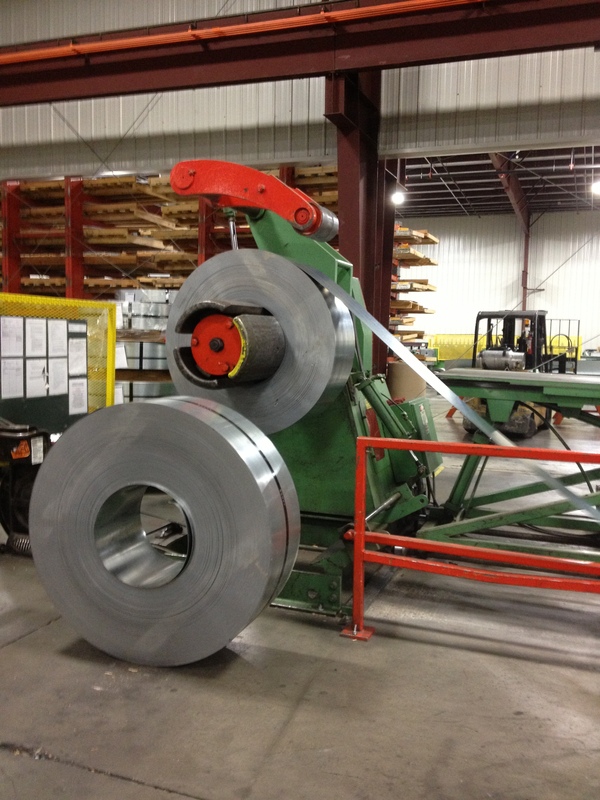 Many thanks to Metal Sales Manufacturing Corporation for today’s tour of their Colorado plant, where they roll form tons of sheet metal wall and roof panels every year (and brake form lots of sheet metal trim). Join CSI at www.csinet.org/join by Friday, November 16th and pay only $192 for national dues, a 20% savings.